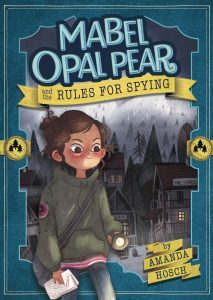 Today I’m shining the Author Spotlight on Amanda Hosch and her debut novel Mabel Opal Pear and the Rules for Spying. 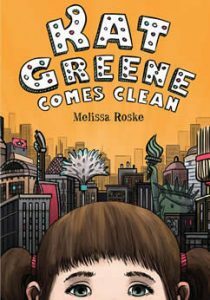 Fifth-grader Mabel (code name Sunflower) wrote the Rules for a Successful Life as an Undercover Secret Agent, so when her parents leave town abruptly she is not too worried–but when her beloved Aunt Gertie is arrested, and her objectionable Uncle Frank and Aunt Stella (Frankenstella) and her annoying (but clever) cousin Victoria take over her house and the family’s private museum, Mabel begins to smell a rat and she is determined to find out what her suspicious relatives are up to. I’ve always loved mystery and detective stories. Mabel’s voice came to me one summer. It was very strong and very sure. 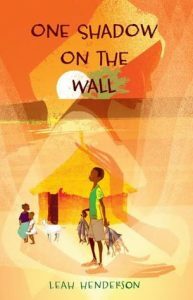 Her parents were secret agents, she knew their secret, and was struggling with balancing their secret and trying to live a normal fifth-grade life. Usually, I write the first two or three chapters to see if the narrator has a story to tell. If I find it interesting, then I plot out the rest. Mabel’s voice was so strong in the first few chapters that I was able to outline the book in a day since I knew exactly what she would do. The short outline had perhaps two or three sentences for each chapter. The first draft took about six weeks. After I was done the first draft, I double-checked some of the fact and trivia, and then revised (of course) and revised some more. How much time do you have? Seriously, so many people encouraged my love of reading and writing, starting with my mother. Miss Linda from the Nix branch of the New Orleans library system. She let me hang out in the “teen” section, which was only two bookshelves and always recommended new books for me. She taught me about the wonders of interlibrary loan. In fact, I was a library volunteer during the summers of my middle school years. Mrs. Lee Klebba and Mrs. Sandra Fassnacht at Mercy Academy both encouraged my writing. Mabel is a typical fifth grader and she’s studied US geography and state capitals (which come into play for the plot), but her secret super power is observation. She really sees what’s going on and trusts her instincts. I’d love to see MOPRS used as a way for students to strengthen their own powers of observation. 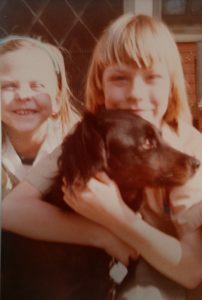 When I was about three, we brought home a shaggy black street mutt from Audubon Park. His real name was Reginald, but I called him Puppy. He was the smartest and most loyal dog ever. He was a street mutt at heart so he would eat anything (crayons, rubber bands, bananas, loafs of bread, frozen whole fish). 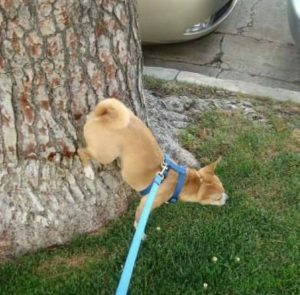 However, he was also super-obedient. One day, my brothers and I put our full lunch plates on the kitchen floor, told him “no,” and walked into the other room. He sat next to the plates, quivering, but not eating a bite. My mother was not pleased with our experiment, and we had to give Puppy the ham from our sandwiches as reward for his restraint. 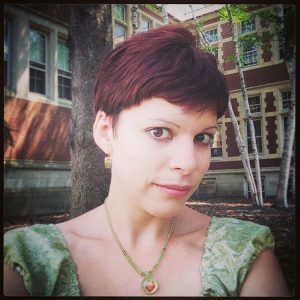 I’m an EFL/ESL teacher (English as a Foreign Language/English as a Second Language) and taught abroad for almost a decade: Canada, South Korea, Czech Republic, and Taiwan. Originally from New Orleans, I now live in Seattle with my husband, our two daughters, and a ghost cat. We recently added two former shelter cats to our family. When not writing, I volunteer at the school library or work with struggling readers. 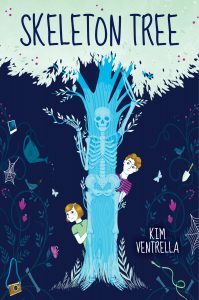 Today I’m shining the Author Spotlight on Kim Ventrella and her debut novel SKELETON TREE. Twelve-year-old Stanly knows the bone is a little weird, but that’s okay, because now he’ll have the perfect photo to submit for the Young Discoverer’s Competition. With such a unique find he’s sure to win the grand prize. But, oddly, the bone doesn’t appear in any photos. Even stranger, it seems to be growing into a full skeleton . . . one that only children can see. There’s just one person who doesn’t find any of this weird—Stanly’s little sister. Mischievous Miren adopts the skeleton as a friend, and soon, the two become inseparable playmates. When Miren starts to grow sick, Stanly suspects that the skeleton is responsible, and does everything in his power to drive the creature away. 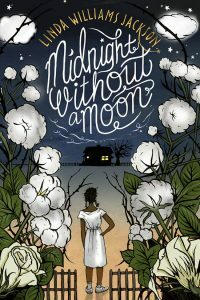 However, Miren is desperate not to lose her friend, forcing Stanly to question everything he’s ever believed about life, love, and the mysterious forces that connect us. I started by asking what would happen if a boy discovered a finger bone growing in his backyard, and the rest of the story evolved from there. I had no idea where my spooky skeleton story would go, but it ended up helping me through a difficult situation in my life. I write fast and revise slow. By necessity more than by choice. I wrote the first draft of Skeleton Tree in two weeks, but the entire revision process took over a year. J.K. Rowling! No, she wasn’t my actual teacher, but she did inspire me to start writing. And books are great teachers! 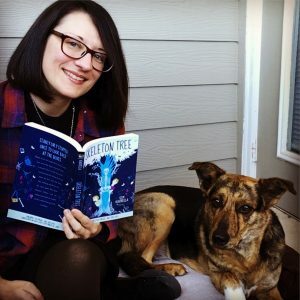 Skeleton Tree would be a great book to spark conversations about losing someone you love. My favorite dog is my dog, Hera! I even mention her in my acknowledgements. She’s super sweet and smart, loves to run in the snow and is great at spooning. 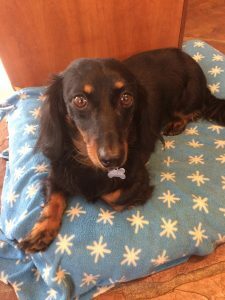 She’s a rescue dog who was seized by the police from her original owners and is now what they call “severely damaged.” Despite being very fearful of people and dogs, she loves life and is a fantastic co-writer. 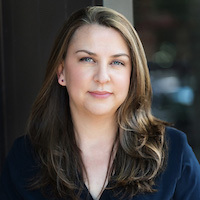 When she’s not writing, you might find Kim Ventrella working as a children’s librarian, hanging out with the best dog ever, or dreaming of snow. 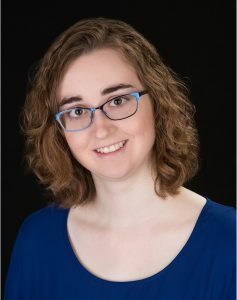 Today I’m shining the Author Spotlight on R.M. 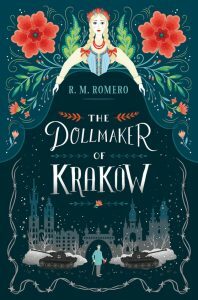 Romero and her debut novel THE DOLLMAKER OF KRAKOW. The Dollmaker of Kraków is a historical fantasy novel that follows Karolina, a living doll who arrives in Krakow, Poland on the eve of World War II. It chronicles her friendship with a veteran of the Great War and a Jewish man and his daughter, and what happens to them during the German occupation of the city from 1939 to 1943. For better or worse, I am what is known as a “pantser.” I don’t outline my books; I let my characters lead me through the story while I’m writing the first draft. Then I go back and revise, cutting out threads that fizzled out and making sure the plot unfolds in a more coherent way. I draw inspiration from music, art, reading nonfiction, and traveling. In middle school, most of my teachers were annoyed by how I was more interested in writing fiction than paying attention in class. But my 8th grade English teacher Carrie actively encouraged me to keep writing. During our graduation ceremony, one of the teachers would say a few words about a student they’d grown close to. When my turn came, Carrie told the audience that one day, they would see a book I’d written on the shelf in Barnes and Noble. It meant the world to me. And happily, her prediction has come true! In a time when hatred and xenophobia are on the rise, I think that it’s valuable to look back at history and see not only how such things can lead to tragedies, but how to actively resist them. The Dollmaker of Kraków is about doing just that. I wanted to write a book that gave a historically accurate and sensitive depiction of the Holocaust and the German occupation of Poland during the Second World War, and I think that it could be paired with lessons about WWII by teachers and librarians. I even have a series of blog posts containing more historical information paired with photos from my trips to Kraków that I plan to put on my website in September. 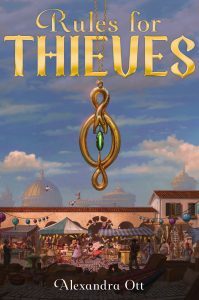 I also wanted to let young readers experience the beautiful and unique city of Kraków and give them a window into Polish folklore and mythology, which is fascinating! R. M. Romero the author of fairy tales and children’s fiction. She lives with her family and a menagerie of pets in Colorado. 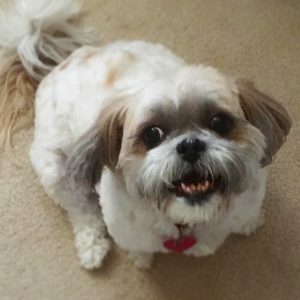 You can visit her online at rmromero.com, Instagram, Twitter, and Tumblr. 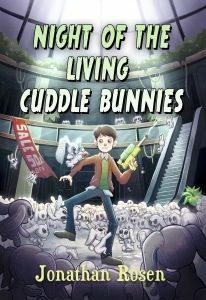 Today I’m shining the Author Spotlight on Jonathan Rosen and his debut novel NIGHT OF THE LIVING CUDDLE BUNNIES. It’s about Devin and his cousin Tommy, who think a witch has moved into the neighborhood. Nobody believes them, until strange things start happening. Things like reports of the hot new Christmas toy, the Cuddle Bunny, coming to life all around town. Devin and Tommy have to prove the new neighbor is behind it, while at the same time being forced to fight the cutest little monsters ever. The story had always been in the back of my mind. I wanted to do something with evil stuffed animals and make it quirky and funny. And then the right timing struck. I had just had a couple of really close calls with a previous manuscript, but get stopped at the very end both times. Both places gave me different reasons why they ultimately passed, but the common thread with both of them, was that they loved the humor. So, with that fresh in my mind, I returned to that evil stuffed animal manuscript, and set off to make the funniest book that I could. I think it lived up to that and the characters were sort of organic. They have their own quirks, which fit and grew into the situation more and more as I went along. I’m such a bad person to ask about this. Writing, I get in whenever I can. If I have a spare half-hour here and there, I’ll jump into write. Mostly, I write at night when the house is quiet and everyone is in bed. What helps me, is having a weekly critique group. I feel the pressure to have a chapter ready for Tuesdays, so I make sure to have something to read then. It doesn’t always happen, but most of the time, I’m ready for Tuesday. As far as research goes, I do a TON. I look up almost everything I want to use. Even if I think I know it all, I look it up to make sure, before I put it in a story. I like this question. I do always remember one teacher who inspired writing. Ms. Spurny back in high school. 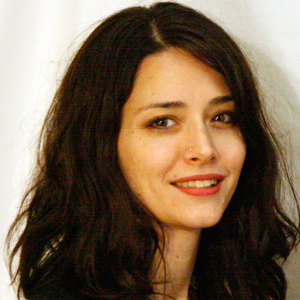 I’d had writing in my English classes before, but she had fun creative writing exercises, which I loved. I’d never had things like that before. I even took some of the exercises she did when I started teaching. Her class was one of the first ones I had, where it wasn’t just learning the proper format of writing. She let us be as creative as we wanted and take a story wherever we wanted to go. My book is funny. Honest! I do think kids will get a big kick out of things in there and there are plenty of jokes for their parents as well. Besides looking up certain references the book makes, I think it will just be entertaining for kids. My kids loved when I did the voices and dialect for the characters, so this is something to reward students for working. I’m sticking to that. My favorite dog is a Chesapeake Bay Retriever (mostly) mutt named Parker. He’s less than a year old and is about the biggest lapdog there is. He’s so loving and loves to cuddle. Oh, I didn’t mention…he’s mine! Love that dog and he’s made an impact on everyone in the house. 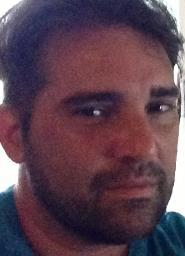 Jonathan Rosen is a transplanted New Yorker, who now lives with his family in sunny, South Florida. He spends his “free” time being a volunteer coach and chauffeur for his three kids. Some of Jonathan’s fondest childhood memories are of discovering a really good book to dive into. He mostly writes middle-grade, because he finds that he shares the same sense of humor as that audience. Jonathan proudly represents diversity by way of being half-Mexican and half-American, though to be fair, neither country is really willing to accept responsibility. 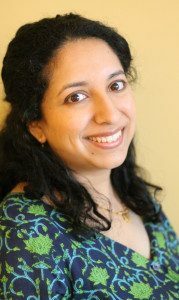 Today I’m shining the Author Spotlight on Kristi Wientge and her debut novel KARMA KHULLAR’S MUSTACHE. 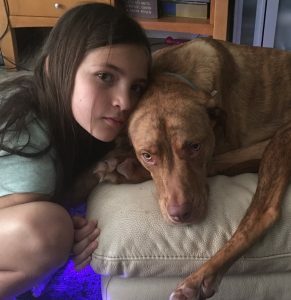 Karma is entering middle school and is super nervous. Not just because it seems like her best friend has found a newer, blonder best friend, or the fact that her home life is shaken up by the death of her dadima, or that her daddy is the new stay-at-home parent, leading her mom to spend most of her time at work. But because she’s realized she has seventeen hairs that have formed a mustache on her upper lip. With everyone preoccupied, Karma has no one to turn to, and must figure out what to make of her terrifyingly hairy surprise. Being a hairy girl, I’ve always wanted to read about a hairy girl, but no one ever wrote a book about this topic. 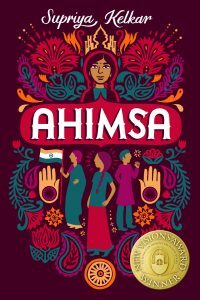 It was only after I attended a master class at a writing conference in Singapore that I was inspired to come up with an interesting character name and once I had the name Karma Khullar, the rest of the story fell into place! For a story to really take off for me, I have to start with the voice. I just tried to put some voice into a manuscript that I love, but lacked voice and it didn’t work. I pretty much struggled for a year trying to squish voice into it. 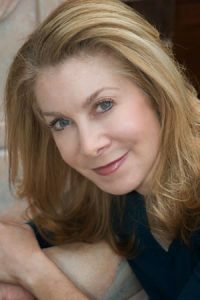 For me, I can have the plot, the emotional arcs, even know the ending, but if I don’t have a strong voice, I’m not going to be able to do the story justice. This question is so easy for me. My fourth grade teacher, Mrs. Clark, was fresh out of college and brimming with ideas. She encouraged creative writing and let me and a friend put on plays for the class. She submitted my work to a publication for children’s writing. My short story Salt and Pepper was accepted and I just knew I was on my way to a Newberry! I’m not sure if the topic of facial hair is classroom worthy. 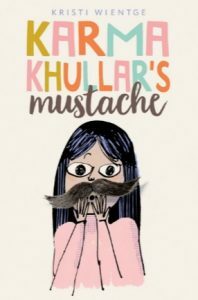 As much as I wanted to read a book about another girl with facial hair as I was growing up, I would have been mortified if we’d read a book about it in class. I’m sure everyone in the classroom would be staring at me! What I would like to see teachers do is share this book with the girls they think it would help. Karma is dealing with more than just facial hair, she’s got family problems and friend problems and even if a girl isn’t hairy, I think it’d make the reader more empathetic towards girls they notice with hairiness issues. 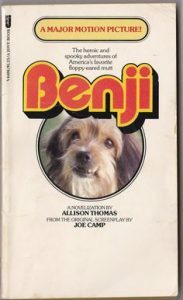 I had a very dog-eared copy of BENJI by my bed for years and years growing up. I can still picture it in my head!